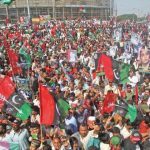 Is Sindh heading to political change ? In the run-up to the 2018 general elections, the political scenario in Sindh Province becomes disconcerting. The heat of political debate increases day by day, especially on social media. Everyone seems against everyone as there is a huge division of opinion. One thing, however, seems certain: that Sindh is far from political change and that soon the bad and weak government will be back. The … [Read more...] about Is Sindh heading to political change ?